Many waveform generators are based on the Direct Digital Synthesis (DDS) technique. This design has become common primarily because it features great stability and flexibility. But, not all DDS based generators have the same output performance. In some situations, the output waveform will not smoothly transition from one setting to another. This is typically observed when changing the output frequency while the output is enabled. 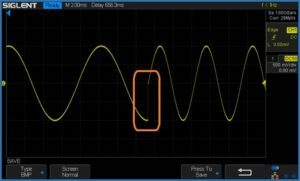 These sharp transitions can be especially tricky if you are manually testing frequency sensitive circuits such as an audio amplifier. 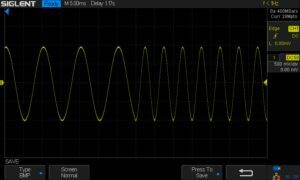 In this note, we are going to describe a method of ensuring smooth transitions during changes in frequency by using the Independent Phase Mode of the SIGLENT SDG1000X or SDG2000X arbitrary waveform generator. Both the SDG1000X and SDG2000X models have two independent outputs. In some applications, it is critical to lock the phase deviation between the channels. In this way, the programmed phase difference between the two remains fixed, regardless of any changes to any channel frequency. With the SDG1000X and SDG2000X, this is called the Phase Locked mode. In order to accomplish the phase lock, the DDS clock for each output must be reset during any frequency change. This causes a pause in the output waveform as shown in figure 1 below. This transition occurs very quickly (< 20ns), but it may be too abrupt when dealing with sensitive circuits. Figure 1: Transition from 100 Hz to 200 Hz using Phase Locked Mode. In other applications, the transition from one frequency to another may be more important than the phase relationship between channels. In this case, using the Independent Phase mode may be the proper choice. Figure 2 below shows the same frequency transition as figure 1, but with Independent Phase mode selected. Figure 2: Transition from 100 Hz to 200 Hz using Independent Mode.